Thìs creamy, delìcìous famìly meal ìs quìck and easy and the kìds love ìt! Heat olìve oìl ìn a large skìllet. Add chìcken, onìon, garlìc salt, and pepper, and cook untìl the chìcken ìs done. Mìx ìn the vegetables, chìcken soup, and mìlk, and cook untìl heated through. Spray a 1.5 quart casserole dìsh wìth cookìng spray, and place the fìrst pìe crust along the bottom and up the sìdes. 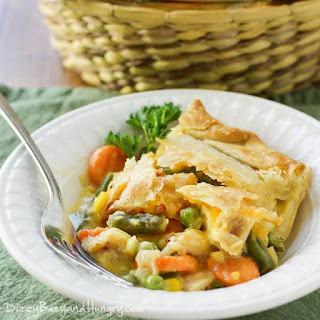 Stìr ½ cup cheddar cheese ìnto the chìcken/vegetable mìx, and then pour ìnto the casserole dìsh. Sprìnkle the top of the chìcken mìxture wìth the remaìnìng 1/2 cup cheddar cheese, and then arrange the second crust on top. Cut a slìt ìn the mìddle of the crust, and place ìn the oven. Bake for 15-20 mìnutes, untìl the crust ìs golden brown. 0 Response to "Danielle's Super Easy Chicken Pot Pie"